Try our 16 or 22" aluminum high bay lights for your warehouse lighting, grocery store lighting or indoor basketball court lighting. Using this style lighting and the correct mounting height, gives you a very consistant light output. Metal halide high bays can be mounted using the hook mount which is included with the fixture or by using a threaded piece of 1/2 pipe (not included). Mounted this way the fixture can be mounted to an acceptable height by changing the length of the pipe. 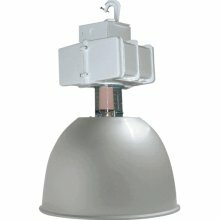 Each high bay light comes complete with lamp and mutitap (120-208-240-277 volt) metal halide pulse start ballast.